The aim of the YTA Schools Programme is to give as many local children as possible the opportunity to play tennis and receive top quality coaching at their school. 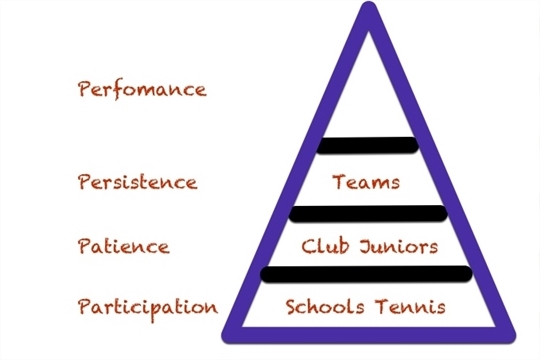 We work on a pyramid system of player development (see diagram), this system seeks to get as many players (children and adults) playing the game of tennis and then helping them progress through our coaching programme to higher levels of play and competition. Through our work in local schools, we hope to introduce tennis to as many children as possible and from there encourage the children to become members of York Tennis Club and take lessons at the club as part of York Tennis Academy training programme. Club lessons will be in smaller groups than lessons in schools (max 6:1 player / coach ratio), with the option for children to take individual lessons in addition to group lessons, to help them progress at a fastest possible rate. From attending club lessons, we look towards progressing children into playing in internal club competitions, as well as Benenden Tennis Fesitvals, Quorn Tennis Events, either as solo competitors or as part of family tennis competitions. From this we look to progress children into our club junior and adult teams. In 2017 we are running 14 external junior tennis teams in the LTA Aegon Competitions as well as another 10 internal teams and internal competitions. From club teams we are keen to progress children into performance competitions locally, regionally and nationally and have many children competing across the country, we also have children who have gained full time tennis scholarships to US Universities to play in their college system. Whilst encouraging children and adults who want to progress up the pyramid, we also encourage play at all levels and it may well be that children and their families do not wish to go beyond enjoying the game and playing socially with friends and it is always very rewarding to see families playing the game together and enjoying tennis at the club regardless of their standard of play.